The ASPCA offers free, high-quality spay/neuter surgery at our clinic exclusively for South Los Angeles cats and dogs! The ASPCA Los Angeles Spay/Neuter Clinic is located at the South L.A. Animal Care Center at 1850 West 60th Street, Los Angeles, CA, 90047. If you have questions, please call 844-MY-ASPCA. Need something closer? Search by zip code for spay/neuter clinic near you. How much does the spay/neuter surgery cost? All of our services are fully subsidized and are provided at no cost to residents in the City of Los Angeles. Please obtain a spay/neuter certificate from the South Los Angeles Animal Services Care Center, which is located next to our clinic at 1850 W 60th St. You may pick up the certificate on the day of your appointment. If you live outside of the above zip codes, you may still qualify for a Free Spay/Neuter Certificate from L.A. Animal Services based on your income. Please visit L.A. Animal Services for more information. If you are unable to obtain a certificate from the city for any reason, please contact an ASPCA representative at the clinic for assistance. What additional services are provided for pets at the L.A. Spay/Neuter Clinic? Note: We do not provide services to animals who are not undergoing spay/neuter procedures. Which animals may NOT be accepted for surgery? 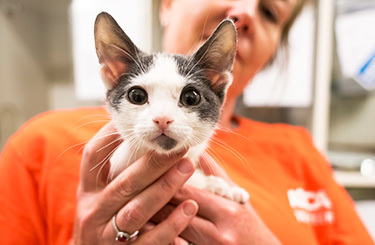 The ASPCA encourages Los Angeles residents to spay/neuter all household cats and dogs. Residents are welcome to bring all pets in the household to the ASPCA Spay/Neuter Clinic, but due to high demand for services, a policy of two pets maximum per household per clinic day MAY be applied. What should I bring with me when my pet is admitted to the ASPCA Spay/Neuter Clinic? Bring photo identification showing you are 18 years of age or older. Bring proof of residence in one of the zip codes serviced by our clinic (this may be a utility bill or other piece of mail). When your dog or cat is discharged from the ASPCA Spay/Neuter Clinic, we’ll provide you with instructions for post-operative care. I manage a feral cat colony in Los Angeles. Where can I get help with TNR (Trap-Neuter-Return)? Please consult FixNation.org or StrayCatAlliance.org for information about TNR in Los Angeles. If you have questions about spay/neuter, please contact us at 844-MY-ASPCA.